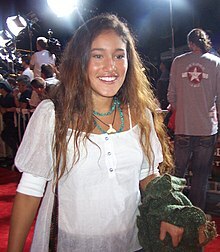 Q'orianka Waira Qoiana Kilcher (born February 11, 1990) is an American actress, singer, and activist. She performed as Pocahontas in the 2005 film The New World, and Kaʻiulani in Princess Kaiulani. Kilcher was born in Schweigmatt, Baden-Württemberg, West Germany (present day Schweigmatt, Baden-Württemberg, Germany). Her name Q'orianka means "Golden Eagle" in Quechua. Her father is of Quechua-Huachipaeri descent from Peru. Her mother, Saskia Kilcher, is a human rights activist of Swiss-German descent, born in Alaska and raised in Switzerland. Q'orianka has two brothers, Kainoa Kilcher and Xihuaru Kilcher, who both work as actors and stunt performers. Kilcher's maternal grandfather was Ray "Pirate" Genet, a Swiss-born mountaineer who later immigrated to America. Her first-cousin once removed is Grammy-nominated singer Jewel. The founding patriarch of their family in Alaska, Yule Kilcher, was a member of the Alaska Senate and delegate to the Alaskan constitutional conference who was originally from Switzerland. When Kilcher was two years old, she and her mother moved to Kapaʻa, Hawaii, where her brother Kainoa was born. Her father, from whom she is estranged, was absent for much of her life. Growing up in Hawaii, Kilcher was inspired by the local culture and started hula dancing at the age of five. She also trained in Tahitian dance and West African, as well as ballet, hip hop and modern dance. In 1997, Kilcher won Ballet Hawaii's Young Choreographer Award at age seven. She was selected to compete at the international Tahitian Dance Competition in San Jose, California in 1996 and 1997. She performed in over fifty professional dance performances island wide. As member of the Waikiki Singers, she was chosen to be the Soprano Soloist, performing Schubert's Mass in G and Amahl and the Night Visitors by Gian Carlo Menotti. At the age of six years, Kilcher was the first child to study classical voice at the University of Hawaii with Laurance Paxton. She also studied Drama with Bill Ogilvie at the Diamond Head Theater. At six years, her mother booked her at venues as featured singer and opening act to some of Hawaii's greats, such as Willie K. (Kahaiali'i) among others. In 1999, her mother moved the family to California. Kilcher started to showcase her talent busking on the Third Street Promenade in Santa Monica. At the age of nine, Kilcher was cast as Choire Who in Ron Howard's How the Grinch Stole Christmas. She was 12 when she received a full scholarship to the Musician's Institute in Hollywood, where she studied vocal performance, music theory and song-writing. She is an accomplished Blackbelt in Wushu, Kung Fu and a Stunt performer and has trained at the National Wushu Training Center and Impact Stunts. At 14, Q'orianka portrayed Pocahontas in the Academy Award-nominated motion picture The New World (2005). Her performance was critically acclaimed and won her the National Board of Review's best breakthrough performance of 2006, the 2006 Alma Award for best Latin American actress in a feature film, numerous other award nominations. The film was released in December 2005 to mixed reviews. The film was a critical success, receiving several positive reviews and award nominations, but it was shown in only 811 theatres worldwide. It yielded a relatively low box office gross. In the summer of 2006, Kilcher began filming the independent film The Power of Few, which she produced through her own production company, Entertainment On-Q. She played the title role in the feature film Princess Kaiulani. The film, about the overthrow of the Hawaiian monarchy, was released in May 2010 to negative reviews. However, Kilcher received positive feedback for her role, with Roger Ebert writing that "she evokes great depth and sympathy in her role and seems to have created Kaiulani from the inside out." In 2009, Kilcher performed in The People Speak, a documentary feature film that uses dramatic and musical performances of the letters, diaries, and speeches of common people in the U.S., based on historian Howard Zinn's "A People's History of the United States". In 2010, Kilcher played Pinti in the family drama Shouting Secrets. The film won Best Film at the 36th American Indian Film Festival in San Francisco and got Kilcher a nomination for Best Supporting Actress. Kilcher also portrayed Kerrianne Larkin, daughter of Chibs Telford and Fiona Larkin, in the television series Sons of Anarchy. In 2011, Kilcher played Tiger Lily in Neverland, a version of the Peter Pan story that aired on the Syfy Channel. In 2013, Kilcher portrayed Rayen in Running Deer, an award-winning short film produced and directed by Brent Ryan Green through Toy Gun Films. Kilcher has made a commitment to human rights and environmental activism. She speaks on behalf of causes to achieve what she regards as environmental justice and basic human rights. Traveling frequently to speak at youth events, colleges and universities, Kilcher has been a featured keynote speaker for organizations such as Amnesty International, the International Forum on Globalization,[clarification needed] Amazon Watch IFIP[clarification needed] and the United Nations panel discussions titled "Indigenous Peoples: Human Rights, Dignity and Development with Identity," in collaboration with the Declaration on the Rights of Indigenous Peoples. She lends her celebrity, voice and energy as spokeswoman, collaborator and supporter to several international and national NGOs and organizations such as Youth Ambassador Amnesty International (Global Youth Ambassador for Woman's Rights), AIDESEP (spokesperson and voice), Interethnic Association for the Development of the Peruvian Rainforest Federations, the Community School for the Arts foundation (volunteer/spokesperson) and Thursdays Child (youth counselor) Turning The Tides (volunteer/spokesperson), Save Americas Forests, IDEM (South Dakota Youth Project) and is a spokesperson for the American Literacy Campaign. Working with the National Endowment For the Arts on their "The Big Read" campaign, she will record a book review. Kilcher has read Howard Zinn's The People Speak in staged readings. She joined the cast for the first People Speak film series. Kilcher recently[when?] launched her own youth-driven human rights and environmental organization "On-q Initiative", to connect young Hollywood with youth activist leaders and projects from around the world in support of environmental sustainability, corporate accountability, and basic human rights. Through her production company, IQ-Films, Kilcher is producing several cause-driven documentaries and youth-programming projects. On June 11, 2009 she visited Lima to support indigenous peoples' rights in the Amazon Bagua, Peru. In 2007, Kilcher won the Brower Youth Award, a premier environmental award, for her work in persuading Occidental Petroleum to withdraw from the Peruvian Amazon valley. She received the Young Hollywood Green Award. On June 1, 2010, Kilcher and her mother were arrested after Kilcher chained herself to the gates in front of the White House in Washington, D.C. while her mother poured black paint on her to signify oil. Kilcher was protesting President Barack Obama's meeting with Peruvian President Alan García, accusing him of selling land in the Amazon rainforest to corporations while suppressing indigenous protests. She and her mother were charged with disorderly conduct. The charges were dropped on June 6, 2011 after they completed community service. On September 4, 2015, Kilcher was part of a group that sang "Love Song to the Earth" The song aims at raising awareness of climate change, with all proceeds benefiting Friends of the Earth U.S. and the UN Foundation. Kilcher and several "Love Song" singers performed in Washington, DC ahead of Pope Francis' address to the U.S. Congress. ^ "The New World Box Office Gross". ^ "The New World Critics Reviews". ^ "The New World: Awards and Nominations". ^ Gardner, Chris (June 8, 2006). "Kilcher takes more "Power"". Variety. Retrieved June 11, 2006. ^ "Roger Ebert: Princess Kaiulani review". ^ "Award Winning Oklahoma Short Film Running Deer is Now Available on Vimeo on Demand". The Oklahoman. 8 August 2013. Retrieved 8 August 2014. ^ "democracynow.org". Actor Q'orianka Kilcher Arrested at White House Protest - Democracy NOW!. Retrieved June 11, 2011. ^ "nbcwashington.com". "Pocahontas" Paints With All the Color of Oil. Retrieved June 3, 2010. ^ "Paul McCartney, Jon Bon Jovi & More Sing a 'Love Song to the Earth' to Support Climate Action". Billboard. Retrieved 2015-10-19. Q’orianka Kilcher on Climate Change Activism - video report by Democracy Now! This page is based on the Wikipedia article Q'orianka Kilcher; it is used under the Creative Commons Attribution-ShareAlike 3.0 Unported License (CC-BY-SA). You may redistribute it, verbatim or modified, providing that you comply with the terms of the CC-BY-SA.